ClickForensics, a company that sells “traffic quality management” solutions, released data about PPC click fraud rates in the third quarter last month. The results are generated by the company’s Click Fraud Index, which collects data from over 4,500 advertisers and agencies. The average click fraud rate in the third quarter was 16%, down from 16.2% in the same quarter last year. The average click fraud rate on search networks like Google AdSense and Yahoo Publisher Network was 27.1%, down from 28.1% in the same quarter last year. Click fraud originating from botnets accounted for 27.6% of all click fraud in the quarter, up from 25.2% last quarter. While the ClickForensics data is to be taken with a slight grain of salt (ClickForensics is in the business of selling tools to fight click fraud), having fallen victim to click fraud myself (and having to go through disputes and the chargeback process to recover my money), I know first hand just how real the problem is. While ClickForensics indicates that click fraud rates seem to be “steady,” I think the data highlights how important it is for online advertisers to stay on top of their PPC campaigns. Some argue that click fraud is a “cost of doing business” and that so long as campaigns are profitable, click fraud is an annoyance. 30% of Google’s revenue in the third quarter was generated by AdSense. This amounts to $1.68 billion. If we assume that ClickForensics’ data is fairly accurate, click fraud generated over $455 million of that. This, of course, is not chump change and represents a significant amount of money wasted by online advertisers both large and small. In my opinion, anything that has the potential to see over 5% of an advertising budget effectively “wasted” on a consistent basis is a real threat to the bottom line that must be addressed. The fact that just over a quarter of the traffic sent from search networks like Google AdSense is, on average, fraudulent according to ClickForensic’s data should give pause to online advertisers who aren’t monitoring the distribution of their ads through these networks. With my PPC campaigns, for instance, I have almost entirely opted out of distribution through these networks. I prefer to select specific sites where appropriate. The most worrying aspect of the ClickForensics data is the increasing amount of fraud from botnets. In my opinion, this is a trend we can expect to continue and it’s a trend that may be underestimated. Botnets, which are made up of computers that are unknowingly compromised and controlled by malware, make detecting click fraud increasingly more difficult because when executed well, click fraud campaigns executed through botnets generate clicks that look valid. Once again, vigilance on the part of PPC advertisers is required to detect the subtle signs of this type of fraud, which include abnormally high click volume or rising click volume over time, unusual referrers and a lack of normal user interaction with the website after click-through. Of course, detecting click fraud requires that you actually collect the data from which it can be detected and I’m always surprised at the number of people I meet who run PPC campaigns and who are either woefully ignorant to the existence of click fraud altogether or who don’t do anything to try to monitor it. While I don’t necessarily advise online advertisers to go out and spend money on services like those offered by ClickForensics (implementation of best practices and simple monitoring of clicks can help ferret out egregious click fraud), not doing anything is foolish, especially in an economy where every cent saved really is a cent gained. 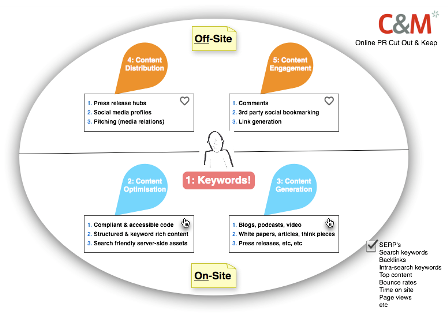 Roger Warner at Content & Motion has devised a handy cut-out-and-keep wallchart to help define and explain online PR. Is Google’s First Click Free a blow to Facebook and Twitter? Google News publishers know all about the wonders and horrors of First Click Free. Google News wants to include prestigious newspapers and let users click through to the stories which matched keyword searches. Some newspapers still want to operate on a subscription model. Although decent organic search engine optimisation (SEO) continues to rely hugely on content, the standard of copy needed to work effectively continues to rise. It used to be that some fairly horrific keyword stuffing could see a website soaring up the rankings, but fortunately now the portals look for ways to assess copy’s popularity and usefulness.